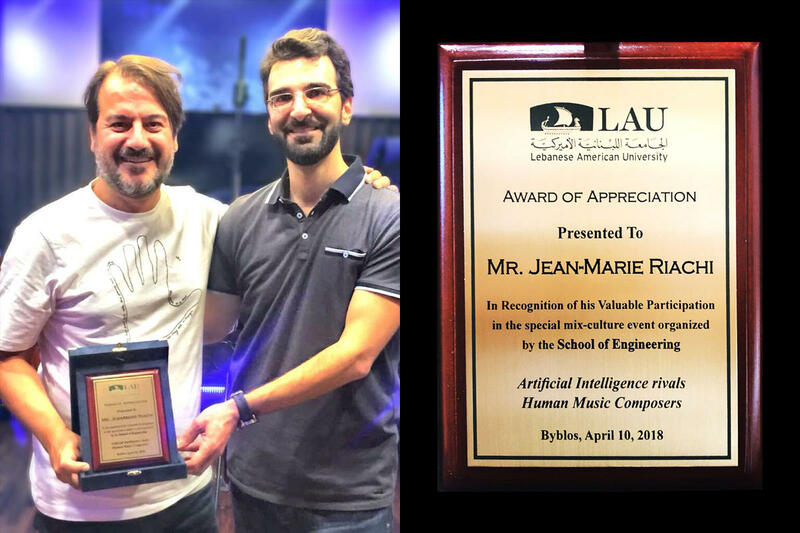 LAU honors composer Jean-Marie Riachi and its own music instructor Joseph Khalife. 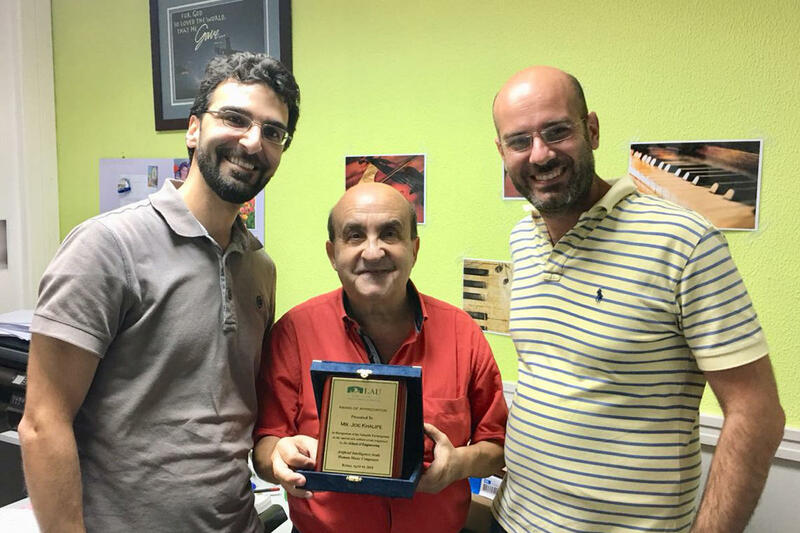 Dean of the SOE Joe Tekli (R) hand delivered the award to Riachi (L) at his studio. Joseph Khalife (C) holds up the appreciation award presented by Dr. Tekli (L) and Dr. Akle (R). Jean-Marie Riachi in his studio. Last spring, he helped stump listeners who were trying to distinguish human-composed music from AI-generated songs. Last week, he received an award from the School of Engineering (SOE) for his work with LAU. 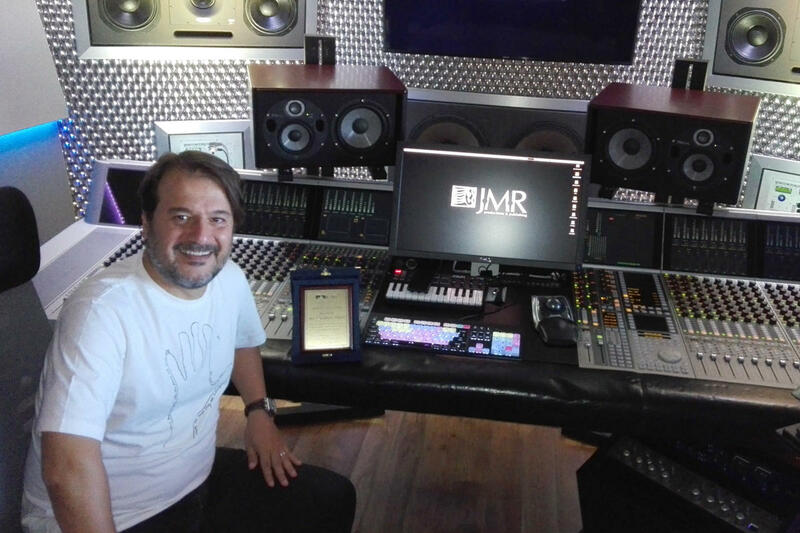 Jean-Marie Riachi is a celebrated Lebanese composer and architect of the hit TV show The Voice Kids. Assistant Professor of Electrical and Computer Engineering and Interim Assistant Dean of the SOE Joe Tekli visited him at his studio last week to hand deliver an appreciation award for his work with LAU and his support of engineering. At a very memorable event this past spring, Riachi took part as a panelist in the SOE’s AI Rivals Human Music Composers workshop, along with composer and LAU Music Instructor Joseph Khalife, multimedia computer engineer and musician at Antonine University Anthony Bou Fayad, SOE alumnus and Oxford graduate student Ralph Abboud (BE ‘17), as well as SOE’s own Dr. Tekli and Dr. Barbar Akle. At the event, the musicians – Riachi, Khalife and Bou Fayad – spoke of the process of creating music and what it means to listeners. Abboud then demonstrated his research project: the AI computer program Music Sentiment-based Expression and Composition (MUSEC), which can automatically compose music based on the mood of a user, and can analyze emotions being expressed in real music pieces. It was up to the audience to guess which music was created by the composers, and which by MUSEC. “The quality and beauty of the music would be lost if not for cutting-edge computerized recording and processing equipment allowing to preserve and highlight its authenticity,” Riachi added. “This is electrical and computer engineering in the service of music as one of the noblest art forms,” Tekli enthused. Akle and Tekli also presented Khalife with a token of appreciation for his gracious participation in the event and his continued and valuable support of artistic, music-related, and extracurricular activities at the SOE. In addition, Bou Fayad and Abboud have been invited by the SOE to participate in two upcoming special events, during which they will be recognized for their keenness, and their passion for LAU and the school. LAU’s SOE continues to regularly organize special events, exposing its students to different innovations and application areas in the various fields of Engineering.